Five of the Candidates for the Pct. 3 Constable position are seen on stage at the North Shore Community Fellowship of Faith church, last Saturday afternoon. From left, Michel Pappillion, Ken Melancon, James Stewart, Sherman Eagleton, and Bill Norman listen to a question from the Pastor, Robert Dixon II. Not present at the forum were Jasen Rabalais, David “Bubba” Jones, Isaac Villarreal, and Eric Reed. 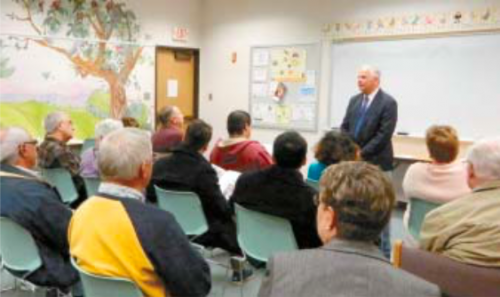 EAST HARRIS COUNTY – The crowded field of candidates for the Position of Harris County Pct. 3 Constable had some light shed on it last Saturday, when five of the candidates met at the North Shore Community Fellowship of Faith church on Maxey Road. All nine candidates had been invited, but for various reasons four of them did not attend. The forum, or panel, was hosted by the church and Pastor Robert Dixon II. The forum itself was moderated by Ayana Mack, a radio personality heard on NGEN radio 89.3, and previously on KSBJ. Sponsoring the forum were the African American Sheriff ’s Association, and the Concerned Citizens of North Shore. The candidates made opening and closing statements on their positions, and most of the time was spent answering specific questions from a panel made up of law enforcement personnel and a lawyer. Each candidate presented their qualifications and their experience, as well as a short statement about how they would run the Constable department if elected. Questions related to youth and community initiatives, profiling of minorities, interaction of police and the community, how to involve senior citizens in community needs, how to reduce the crime rate, how to deal with the drug problem, how to be safer when gun laws encourage arms, how each feels about body cameras, diversity of the constable’s department, what training each has to deal with terrorism, how proposals including more training will be paid for, and what programs should be available to rehabilitate inmates. 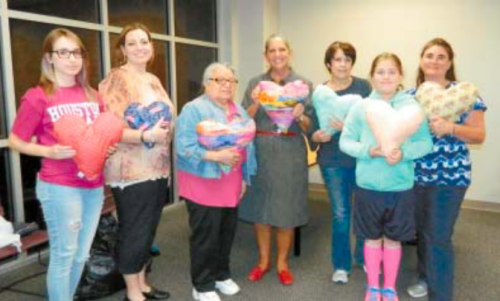 MEMBERS OF THE SAN JACINTO PILOT CLUB were busy last week, making “Hug-A-Heart” pillows for patients at Texas Childrens Hospital. They make over 200 hearts twice a year as one of their community projects. Working on the pillows are, L to R, Kasi Schultz, Kim Schultz, Genevieve Pierson, Joan Van Fleet, Karen Westbrooks, Jillian Fallin, Julie Fallin.